"The Heart is an Open Book." The central teaching of Sufism is that each being has within itself all knowledge of its being, just as the seed contains all knowledge of the tree. Each being has knowledge within of its course in presenting itself as a being, and knowledge of where it will go. Each being is a complete book, a book that can only be read by the being itself. "Knowledge is not in the sky to descend upon you, nor is it in the earth to grow for you, but it is innate, hidden within you, until the human being is recognized in his totality as an absolute being with all of his capabilities and capacities in every stage of his existence." Each individual is subject to discovery of this inner being, this absolute knowledge within him or herself. The knowledge is there for him or her to attain. Therefore, the best place to look for the answers to our being is right within the unbounded reality of ourselves. In this context, each person is the researcher, the laboratory, and the subject of study. The outermost level is the level of nature, which is the laboratory for human experience. The second level is the physiological level, the cellular, organic level which functions according to its own inherent programs and laws. The activities of this level are generally a combination of sensory activities, thoughts, cellular needs, and experiences, as well as cultural heritage and personal aptitudes. Medical science focuses on this level and its useful technological and treatment advances have dealt with aspects of the cellular, organic level. The third level is the developmental level, the locus for mental, sensory and psychic powers and for the development and interrelationship of the magnetic bodies. The fourth level is the innermost level, the mysterious level, which is the point of stability and true personality 1 . This is the level which is the source of knowledge as announced by the Prophets, and the focus of the teachings of Maktab Tarighat Oveyssi Shahmaghsoudi.®"
Each level of the human being has its own sphere of operation, and is submitted to the laws governing it. The instructions of the Prophets are meant to acquaint people with all the levels of their being, their interaction and relationship with the extensive universe, and the laws governing their being, so they may live in peace and tranquility and know eternity. in the heart of whom He wills." 1. 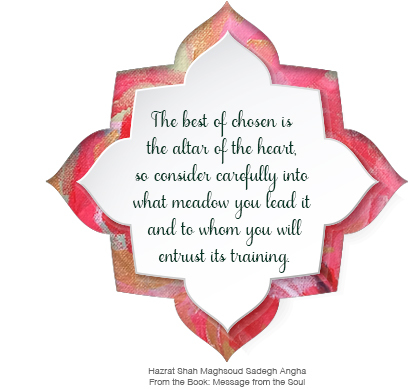 Hazrat Salaheddin Ali Nader Shah ANGHA, Sufism and Wisdom , M.T.O. Shahmaghsoudi® Publication, Washington D.C. 1997, pp. 18-19.